Here’s a book I had forgotten I had, relatively speaking; I obviously bought it back in 2006 or so, but I didn’t read it right away and so it sat on my shelves among many other books (by Sagan and many others) for years. As I was packing and unpacking books during our move a year and half ago, I noticed it anew, especially since it appeals to my current interest in the grand scheme of things, how science and religion and science fiction intersect and relate. So I pulled the book off the bookshelf, and onto my to-read-shelf, and finally read it last month. The book compiles a series of lectures Sagan gave in 1985, just five years after his TV series Cosmos was broadcast to great acclaim and made him a media star and frequent Tonight Show guest. The book didn’t appear until 10 years after Sagan’s death in 1996. It’s subtitled “A Personal View of the Search for God”, and is edited by Ann Druyan, his wife, and later writer of Neil deGrasse Tyson’s recent reboot of the Cosmos. All those beautiful words, in that series, that I sometimes quoted at length (e.g. here, were narrated by deGrasse Tyson — but written by Druyan. And in fact Dryan’s introduction is gorgeous and inspiring, but for the moment I’ll focus on Sagan’s lectures. The irony is that the lecture series in which Sagan was invited to participate back in 1985 was on the topic of “natural theology”, i.e. the idea that theological knowledge can be established by reason and experience and experiment alone, not by revelation or mystical experience, as Sagan describes in lecture 6. It’s ironic because Sagan, delicately but repeatedly throughout these lectures, dismisses the notion of such theological knowledge. Sagan, throughout his many books, avoided any direct discussion of his opinions about God, or any implication of his atheism. 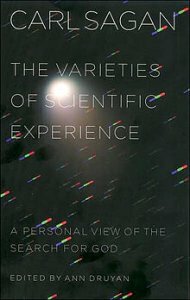 He preferred to dwell on the positive, so to speak — what experience and experiment tell us about the universe itself, and how grand it is. So without ever directly challenging any religious beliefs, in these essays, he repeatedly, politely, mentions such notions and then wonders if we should not perhaps seriously consider that there might be better explanations. In so many words, or less. The book is a tad dated in its preoccupation with issues that were important to Sagan, and to society, at the time: UFOs, ancient astronauts, the threat of nuclear war. And this vast number of worlds, the enormous scale of the universe, in my view has been taken into account, even superficially, in virtually no religion, and especially no Western religions. Science, Sagan suggests, is informed worship. We tend to “project our own knowledge, especially self-knowledge, our own feelings, on others” and we have a sense of privilege, thinking ourselves the center of the universe. Yes! — here is Sagan, 30 years ago, anticipating what psychologists have been confirming and crystallizing in recent decades, about human mental biases (as posted here about David McRaney, among several related posts). Thus Aristotle presumed a privileged Earth, stationary, around which everything else turned. He was wrong; nor were the heavens perfect. More recently resistance to evolution is an “assault to human vainglory” 39.3; special relativity in the 20th century; dismissing the argument from design; explanations for the anthropic principle; quoting Rupert Brooke’s poem “Heaven” about a fish’s view of reality and eternity. There are no crystal spheres. 64.2: “The history of science in the last five centuries has done that repeatedly, a lot of walking away from divine microintervention in earthly affairs.” We’re left with a God of the Gaps, a do-nothing king. Evolution is not intuitive because it involves vast amounts of time. Why the objection about the odds against complex molecules randomly forming, like a Boeing 747 forming by a whirlwind, is misguided and ignores the reality of evolution. We have concepts for more *powerful* beings than us (angels, demigods), but not for beings more intelligent than us. Even scientists can get things wrong, lured by a predisposition to believe: Schiaparelli and his (mistranslated) ‘canali’. What kind of evidence would convince us of demigods, or ETs? Plausibility, to begin with. The Drake equation, failures of imagination, and a Clarke quote about the threat to Christianity of the discovery of ETs. People get angry when ‘miracles’ are explained. History of failed prophecies, e.g. charismatic leaders who predict the end of the world, and whose believers still believe even when the world doesn’t end! Discusses the emotional stakes people have in wanting to believe, comparing it the the skepticism inherent in buying a used car. And you do this for something as unimportant as an automobile. But on issues of the transcendent, of ethics and morals, of the origin of the world, of the nature of human beings, on those issues should we not insist upon at least equally skeptical scrutiny? Many ideas of God over the centuries. Suppose there were proof of a god who, say, originated the universe but was indifferent to prayer? Why didn’t God do it right in the first place? You start out the universe, you can do anything. You can see all future consequences of your present action. You want a certain desired end. Why don’t you arrange it in the beginning? The intervention of God in human affairs speaks of incompetence. Our emotional predispositions were set millions of years ago, to some selective advantage. We can examine them by studying modern primitives. Hunter-gatherers. Some are highly hierarchical; others more democratic. One scientists analyzed them against characteristics of whether they hug their children and whether they permit premarital sexual activity among adolescents. Where these things are not permitted, powerful hierarchies emerge; where they do, such hierarchies don’t exist yet everyone’s happy. The formative experiences of propitiating adults lingers into adulthood. “Could that have something to do with prayer specifically and with religious beliefs in general?” 178.4. As Freud suggested. Moving on to discussion of chemicals in the brain. Hormones. LSD. Suppose something called “theophorin”, a material that makes you feel religious. Wouldn’t be useful, for social conformity? Submission to the alpha male, the ruling classes, the biblical God? Thus science, unprecedented from previous eras. Evidence of extinctions 65mya. The current threat is nuclear war—but how have religions reacted to the threat? The most dangerous are the Christians who see the prospect as consistent with Revelation, and welcome it. The nations of the world stockpile more weapons; what about the Christian dictum to love thy enemy? No nation takes that view. The search for meaning is two-pronged: to understand the universe, and to understand ourselves, p213m. We are still a world of tribes growing into city-states, nations, empires. We need new alternatives; “We run the danger of fighting to the death on ideological pretexts.” 216.8. History is a battle of inadequate myths, everyone feeling threatened that their own worldview might be exposed as a lie, willing to fight to prevent that, p217t. The prevailing conclusions of science are poorly accommodated by religion, 218. But things have changed: we’ve abandoned the divine right of kings, we’ve abandoned slavery. goes with a courageous intent to greet the universe as it really is, not to foist our emotional predispositions on it but to courageously accept what our explorations tell us. This entry was posted in Cosmology, Culture, Evolution, Human Progress, Provisional Conclusions, Religion, Science. Bookmark the permalink.